Immigration is frequently described as providing a counter-balance to the UK’s ageing population. As an ever-larger proportion of British residents is retired, large numbers of immigrants help keep the average age down and contribute much-needed taxes to the Treasury coffers. But how much does Britain benefit – and how do this compare with the costs of a growing population? 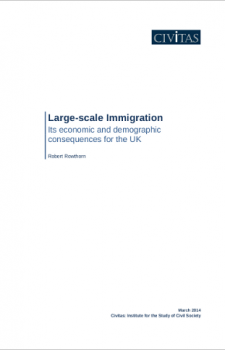 In this new analysis of the economic and demographic consequences of current levels of immigration, the distinguished Cambridge economist Robert Rowthorn finds that the potential economic gains from immigration are modest compared with the strains placed on amenities such as housing, land, schools, hospitals, water supply and transport systems. While GDP as a whole will grow with increased immigration, Rowthorn notes, GDP per capita – a much better indicator of the nation’s wealth – will be only marginally affected by the enormous population growth forecast for the coming century. He cites the Office for National Statistics’ high migration scenario, which sees growth in the UK population of 20 million over the next 50 years and 29 million over the next 75 years – entirely from migration. This is equivalent to adding a city almost the size of Birmingham to the UK population every two-and-a-half years for the next 75 years. “Unrestrained population growth would eventually have a negative impact on the standard of living through its environmental effects such as overcrowding, congestion and loss of amenity,” Rowthorn writes.